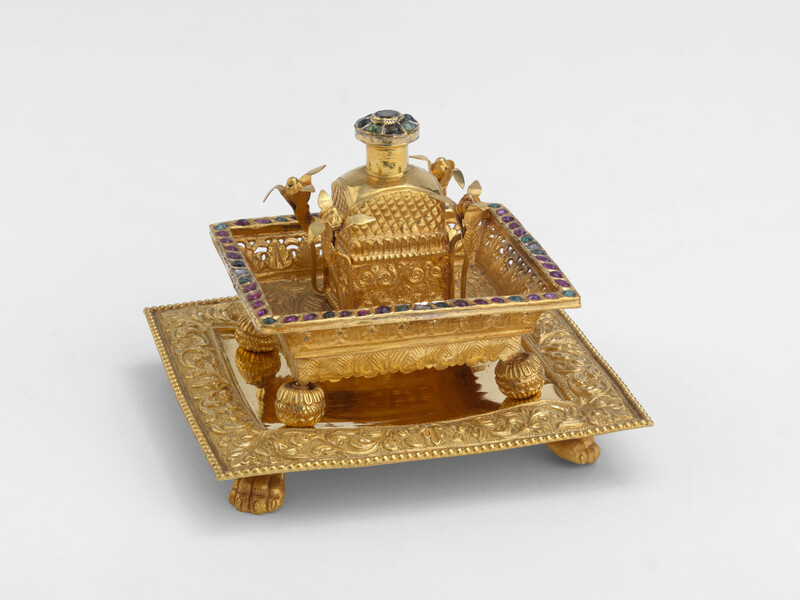 This perfume holder was presented by Banesinhji Jaswantsinghji, Raj Sahib of Wankaner (1842–81), and was probably designed to store solid perfume. The inscription in Gujarati on the lower tray is obscured from view by the upper tray and bottle, indicating that they were made separately and then attached together at a later date, probably to make a more impressive gift. The screws holding both the trays together unscrew anticlockwise. This is unusual in Indian metalwork and implies this perfume holder was assembled by a non- Indian craftsman possibly working in Bombay, where this gift was presented.